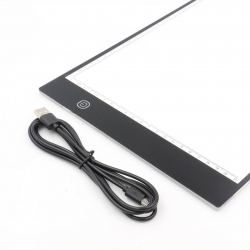 1 x LED Drawing Board. 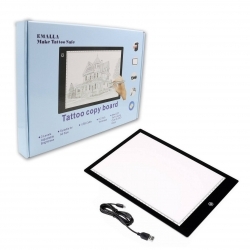 Usage: Ideal for tattoo copy pad, tattoo transferring, sketching, and drawing, etc. High quality: Good light transmittance, protect eyes and excellent toughness, energy-saving and pressure resistance. Smart touch switch: Set your favorite brightness, when you next boot will automatically remembers the last adjustment of brightness. 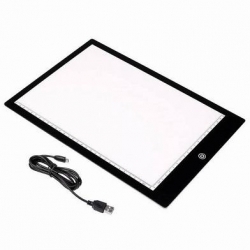 Convenient: Led touch adjust light brightness meets your needs. 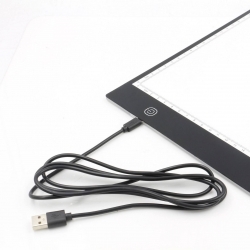 USB powered: Easily power your light box from any USB devices like computer, power bank or directly supply and so on. Portable: Lighter and thinner for your easy carry. Feature: Eco-friendly LED ensure extreme low calorific value and life span up to 80000 hours.With a clip to fix paper firmly.